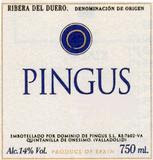 Pingus, at present is Spain's most popular and lauded red wine and has given the Ribera region of Spain immediate renown. Since 1990 the Dane, Peter Sisseck, has managed the estate, the Hacienda el Monesterio. He learned his trade of wine making in Bordeaux and was inspired by Valandraud in Saint-Emilion. With utmost care and following ecological principles, he still tends his vineyards, which lie in probably the best terroirs of the Ribera region, restricting his yields drastically. Then he waits patiently for the grapes' optimum ripeness, before they are hand-picked and taken 25 miles in small crates by refrigerated truck to his wine cellar in distant Quintanilla de Onesimo. Here, ten women de-stalk the grapes by hand, before lightly crushing them underfoot in small stainless steel fermenting tanks. Being early in October the night are cool and the grapes lie in their own must for ten days before fermentation sets in; and this usually lasts another eight days. Generally, Peter Sissek lets the wine macerate for only a few days before he takes off the stems and pours the juice into new French Barrels. After malolactic fermentation occurs in the warmer spring weather, each single barrel is tasted to ensure proper maturity. After around 2 years in barrel the highly sought after Pingus is bottled. Such dedication and hands on work are only a part of the reason this wine demands prices that compete with the top clarets from around the world. The quality and beauty in the bottle speaks for itself. Stay tuned for future reviews of the Second labeling of this bodega called "Flor de Pingus". I have one waiting in my cellar! Hello, Bacchus. I wanted to say thank you for the post our new beta site, WineNooz. Even though we're just getting going, I do believe our community has the most blog feeds about wine in one location. Since you provided a link to your wine blog site, I have added it to our "stream" of blogs which is updated daily, by the hour and minute. From now on, every time you post, your headline and link will appear there. Keep up the good blogging work, come over and visit us and post when you can. Also, we would love to have a line to WineNooz on your site. P.S. We welcome any and all feedback. Just click on the Ask Out Loud tab and speak up, or like you've already done, comment anywhere you like.